Bored? Why not take a moment and conquer England? 15 Responses to Bored? Why not take a moment and conquer England? The English have conquered themselves. They have sunk to the level of the French. Wait! Have they hocked the crown jewels to pay for the NHS yet? Those should be worth something. Mine has the uber-cool quick-change assault chuck. Okay for now, but nobody needs a high-capacity electricity magazine clip. Apparently not. Which is what’s so sad/funny. Joel: you’re double-dangerous- not only is that a high capacity rechargeable magazine clip, it’s REVERSIBLE! Seriously? 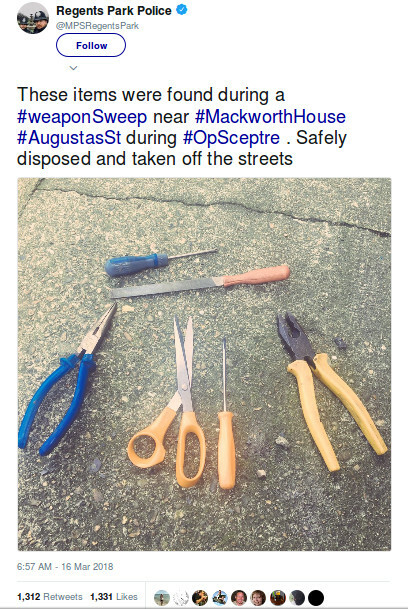 Those tools had to be taken off the streets? Goodweepingawd. My SUV is apparently carrying the Brit version of an arsenal. South-east UK (it’s not England, dammit!) resident here confirming it’s not a joke, or at least not intended as one. What legally constitutes an “offensive weapon” is entirely up to the policeman doing the search. In theory you can legally be in possession of tools, even (shudder) knives, in a public place if you have “good reason”. Most of the things in the photo would be legal to carry if you were, say, a carpenter or electrician. If you could prove you were the cop might let you off, then again he might not. Knives are a bit riskier to carry. Anything with a three-inch-or-smaller blade, that does not lock open, and it not on the list of super evil instruments of death (e.g. switchblades, butterfly knives, etc.) is OK. You can still be arrested for using such a knife “in a threatening way”, definition of which is again entirely down to the cop. I’m sure utopia is just round the corner. They had a show, the bad guy used a portable air canister nail gun AS a gun. Why didn’t I think of that. Last year I bought myself a stock cane – a stout 1″+ dia. cane of oak with a crook just a bit wider than an ordinary cane. (it’s used for hooking and otherwise maneuvering small livestock) In my copious free time I’m giving it a more conventional makeover in order that it look a bit less cudgel-like in non-permissive environs. As thick as it is it’s easy to do some decorative removal and still have a solid tool. I’d priced some specialty canes meant for surreptitious martial purposes and they’re expensive – whereas a 3′ stock cane ran about $15 – and the 5′ one was about $20. Local feed or farm stores often stock them or can order them – and they can be had online too. Coming up with a convincing ‘hitch’ is easy as is a story to go with it. Places where one can’t CC are rare in my life – but I figure I’d plan ahead and have an option if it came up. I thought when I saw it that it was an incredibly dumb idea. 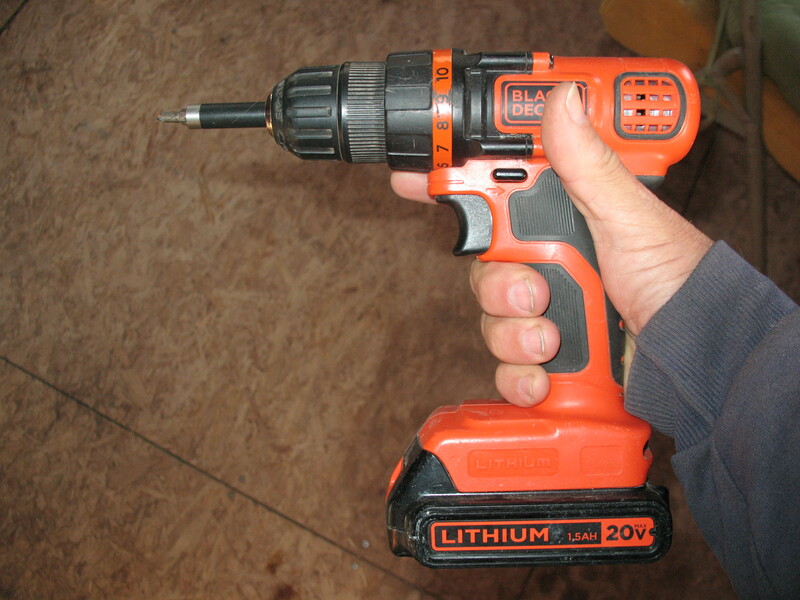 Now I’m thinking maybe not, since electrician’s pliers turn out to be so scary I could rule the world with a nail gun. PNO: I like the way you think. Next stop: Farm & Fleet. When you type “stock cane” into the Amazon.com search window, strange things happen. Just tried it. Wow. I think it’s time to exit the internet for the night… Welcome, Morpheus!